Do you spend so much time on the web that you are paying less and less attention to written words? Less and less time reading and more and more time gleaning that 3-5 seconds of information from images, pictures and graphics? I am, and I had a remarkable realization of it today when I saw a simple triangle shape and three words: good, cheap, fast. 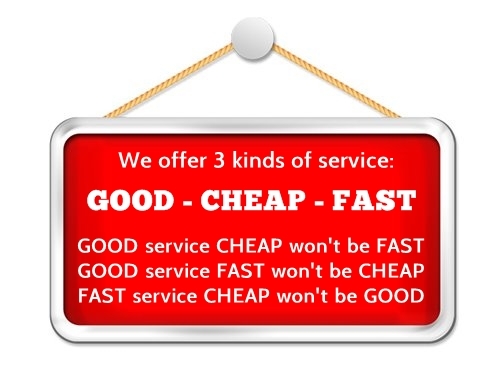 The triangle and the words spoke volumes to the need for me to be more focused on defining quality, cost and turnaround times on my website projects. This combination of elements (scope, money, and time OR good, cheap and fast) is referred to as the Project Triangle. Mid and end-of-project changes will kill the profitability and overall quality of a project, and mid-project consultation sessions that are freely engaged in will enable those changes. Lack of establishing and sticking to the scope of what good, cheap and fast means to both the designer and to the client. I have a tendency to want to provide exceptional service to my customers. Don’t you? And because of that, I can end up compromising the integrity of the triangle. If attraction rather than promotion is a means by which you govern your business, then those three little words in the triangle have some definite power. Independently, they can be applied in a positive light to any product or service you are seeking. But when placed together into a specific purpose, such as a website construction project or some other effort to strengthen your business’ online presence, they each become elements that are effected by the other. Build something quickly and to a high standard, but then it will not be cheap. Build something quickly and cheaply, but it will not be of high quality. Build something with high quality and do it cheaply, but it will take a long time. Some of you may already recognize exactly what this triangle and those three words attached to it mean. If you do, you’ve probably had some exposure to project management principals or modeling for project-based work. If time, money, or what your project accomplished were unlimited, you wouldn’t need to care much about the Project Triangle. However, most projects have a specific time limit, budget, and scope. This triangle is not only a highly useful tool for illuminating the elements of any website project, but is also highly useful for discussions with a client. Using it as a mnemonic device is often the best way to establish the baseline direction and constraints of the project, and at the same time establish a recognizable tool that can be referred to later on in the project’s status. It is especially useful at the mid-term and end of the project where portions of the project inevitably get changed or adjusted; it’s at these points that you can physically refer to the triangle, point to each side of it and avoid angst and re-explanation of the project. The Project Triangle is an imperative tool for keeping your quality, your cost and your time in perspective. 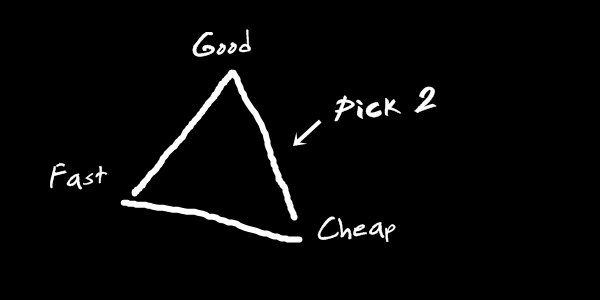 Good, cheap and fast are competing elements and understanding the project triangle will allow you to make better choices when you need to make tradeoffs. So what are the commonly seen tradeoffs? 1. Construct a website quickly and to a high standard, but it will not be cheap. Constructing something quickly and to a high standard will require a greater number of resources. That means working around the clock with no sleep or food until completion, or hiring additional specialists to complete the task, or both. Either way, how and why should this service be cheap? 2. Construct a website quickly and cheaply, but it will not be of high quality. Constructing something quickly and cheaply will mean that less time will be spent and fewer resources will be used over the short period. The results will not be of a high quality. Cost and time restraints often result in mistakes, having had insufficient time for thought, mid-project flexibility or quality. 3. Construct a website with high quality and cheaply, but it will take a long time. Constructing something with high quality and cheaply will mean taking more time, lots of thinking and research space, and the services will be applied on a non-primary basis. Meaning, your project is not the priority for completion over other more well-funded projects. The ‘Good’ side of the triangle is by far the most difficult to put your finger. Fast is fast. Cheap is cheap. But what is good? – ‘Good’ is a flawless user experience. – ‘Good’ is well designed. Functional and pretty. – ‘Good’ is the result of passion and hard work. – ‘Good’ is not just reliable, but indispensable. For quality, cost and time planning – which defines the good, cheap and fast elements – we are funneled into discussing only a focused number of pertinent options based on the three sides of the triangle.